Home » Sports » New York Mets Pitcher Jonathon Niese has a New Nose! 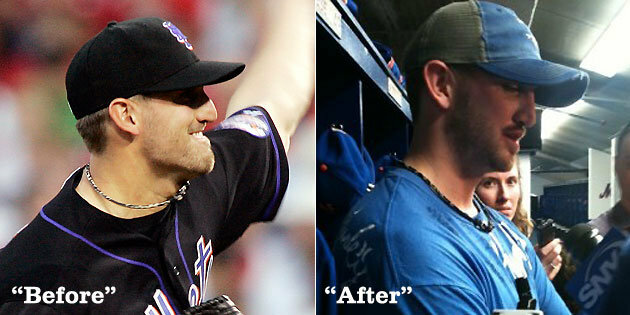 New York Mets Pitcher Jonathon Niese has a New Nose! Probably the strangest story from Mets, New York Mets pitcher Jonathon Niese arrived at the team’s camp on Monday and said that he had received a nose job over the offseason. Jonathon Niese had a successful nose surgery thanks to the advice from his ex team mate Carlos Beltran who will now play for San Francisco Giants. Seems like Carlos Beltran been stressing Niese to go for nose surgery for aesthetic concerns which has now turned out to be a blessing in disguise for Niese. When Niese visited a doctor after the end of the regular season, it became clear that there could be some ancillary benefits, as well. Niese said he has always had trouble breathing through his nose, which he felt hindered him during cardiovascular exercise. It never occurred to him, though, that a surgical procedure could remedy the problem. The doctor conducted a scan that showed Niese’s nasal passageways were obstructed, but that they could be reconstructed to facilitate airflow. Niese had the procedure done in October, a few days before his birthday. Lol! He also added that, Carlos is yet to pay the bill for him , jokingly quoting, he may send the bill to Carlos for payment. Next: Chardon High School Shooting!